With Red Oak Cafe’s closure, Pitt students could go hungry come fall. But here at The Pitt News, we won’t let that happen. There are plenty of restaurants in Oakland to choose from — you just need to find the right spots. We’ve enlisted some editors and writers from The Pitt News to compile some of their personal favorite restaurants in Oakland to save you from spending money when taking a well-deserved break from Market Central. Living in Oakland, you will often find yourself in conversations about where you and your friends want to go eat. For some reason, you find that even though Forbes Avenue is literally lined with restaurants, nothing seems to fit the bill for whatever your posse is craving. Whenever I am in this scenario, the best bet is usually Hello Bistro. 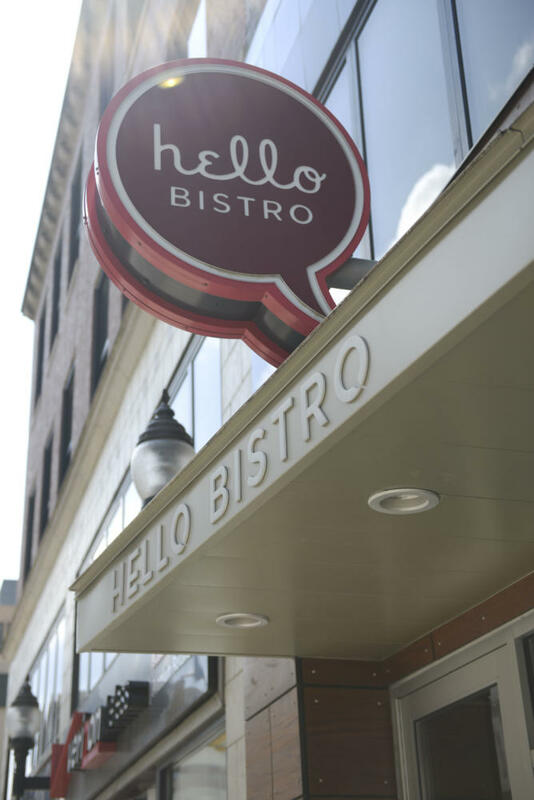 Hello Bistro is located on Forbes and can’t be missed with its garage door-style window. With a quick glance at the menu, Hello Bistro may look like some generic salad bar, but what makes it such an appealing option for students is the variety of items you can choose from. If you or any of your friends are vegan or vegetarian, there is something for everyone, and those options do not feel tacked on. Salads can be custom-ordered for whatever your diet may be, and if you want to get a quick fix of calories, their burgers, fries and grilled cheeses are pretty excellent. Although its name is sure to elicit some chuckles from freshmen passersby, Sushi Fuku doesn’t play around. “Fuku” actually means “luck,” so the restaurant name actually translates to “Lucky Sushi.” But it’s still fun to say. Sushi Fuku has tons of options for vegetarians and vegans, including tofu and an array of vegetables. There are two locations of this fast-food-style sushi restaurant in Oakland — one on Oakland Avenue and one on S. Craig Street, and both are open daily from 11 a.m. to 9 p.m. Patrons can choose either a chirashi bowl, a sushi burrito or a sushi roll and customize each — almost like at Chipotle or Subway. With its locality and meals ranging from $6-8, Sushi Fuku is definitely one of my go-to fast-food picks in between classes. When people ask me what my favorite things about PIttsburgh are, one of my top answers is a possibly unexpected one — a Chinese buffet. The selection of food here is great — everything you would expect from a good Chinese food menu, plus some extras. The place is super vegetarian-friendly with options like sweet and sour mushrooms, sesame tofu and a wide array of vegetables. The atmosphere is relaxed, with quiet pop music often playing in the background, and it’s a perfect place to meet your friends for a bite after a long day of classes. Just be ready — you’ll love it so much that once you go, you’ll want to go back immediately. Stack’d may be just like BRGR and Burgatory in that it lets you choose exactly what you want on your burger ingredient by ingredient, but Stack’d separates itself with its half-off menu Monday through Thursday from 9 p.m. to midnight. Every Monday, my coworkers and I head over to Stack’d at 8 p.m. for Buzz Worthy Pub Trivia, where we go head-to-head against other teams in five rounds of trivia with a wide variety of categories like mathematical equations, famous cartoon dads, Pittsburgh neighborhoods and an entire evening dedicated to “The Office” trivia. When the late night special begins at 9 p.m., the kitchen begins busting out orders of chicken tenders coated in your favorite sauces for only $3.50. The deals continue on Tuesday with half-off burgers, Wednesday with half-off quesadillas and karaoke and Thursday with half-off wings and drink specials. During my three years at Pitt, I’ve seen this building on the corner of Oakland and Forbes take on a variety of identities, with Joe Mama’s closing in the fall of 2014 and Olio Trattoria closing only a few months after its opening. But Stack’d, with its cool, laid-back vibe and a menu that is sure to please everyone, seems to be here to stay.